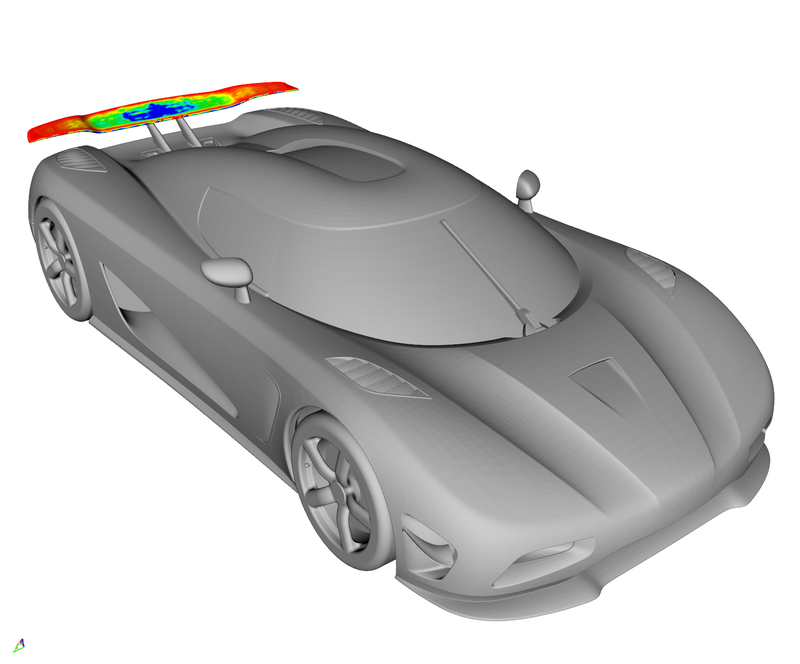 In this case study, the rear wing of a hyper sports car was optimized with respect to the drag and downforce. 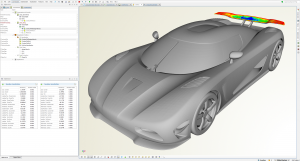 For the adjoint CFD computations, the software package iconCFD was utilized. The parametric model of the rear wing was set up in CAESES, as well as the mapping of the adjoint solution to the geometry parameters. For the rear wing, a flexible profile shape got defined, which was swept along a 3D contour. Functions for each profile parameter were created so that the shape could be intuitively controlled by a set of 19 parameters. Geometry constraints regarding span and chord length were automatically met (inbuilt into model), so that only feasible design variants emerged from the variation. The adjoint CFD results that gets provided by CFD tools such as iconCFD can be directly utilized in CAESES. These results can be automatically mapped to the user-defined geometry parameters. 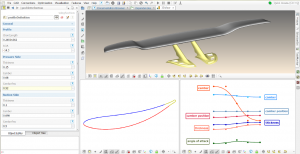 In this case, the adjoint results were mapped to the rear wing parameters. More accurate, they were mapped to the functions of the profile parameters. This is done by a “Sensitivity Computation”, for which a tutorial is also available. With this technique, it was easy and fast to detect the most important variables. The CFD setup itself consisted of ~18 mill. cells, so that the primal CFD run took about 7h, while the adjoint run needed about 5h to be computed, both on 64 CPUs. The top-5 of most influential parameters for drag and downforce were picked out from the sensitivity computation, where most of these parameters pointed into opposite direction for the two objectives. Based on this knowledge, two further geometries got created – one that optimized the drag (~-1%) but deteriorated the downforce (~-3.8%), and one that optimized the downforce (~3.9%) and even slightly the drag (~-0.03%). There is also a published paper (German) available which describes this study in detail, see our papers section. Just drop us a line if you want to receive this pdf.